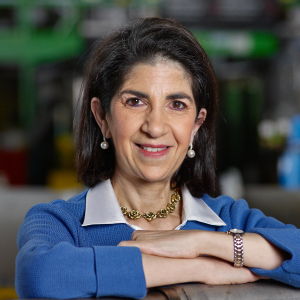 Fabiola Gianotti received a Ph.D. in experimental particle physics from the University of Milano in 1989. Since 1994 she has been a research physicist at CERN, the European Organisation for Nuclear Research, and since August 2013 an honorary Professor at the University of Edinburgh. She is also a corresponding member of the Italian Academy of Sciences, foreign associate member of the National Academy of Sciences of the United States and of the French Academy of Sciences, honorary member of the Royal Irish Academy and Foreign Member of the Royal Society, London. Dr Gianotti has worked on several CERN experiments, being involved in detector R&D and construction, software development and data analysis. From March 2009 to February 2013 she held the elected position of project leader (”Spokesperson”) of the ATLAS experiment. The ATLAS Collaboration consists of 3000 physicists from some 38 countries. On 4 July 2012 she presented the ATLAS results on the search for the Higgs boson in an historic seminar at CERN. This event marked the announcement of the discovery of the Higgs boson by the ATLAS and CMS experiments. Dr Gianotti is the author or co-author of more than 550 publications in peer-reviewed scientific journals. She has given more than 40 invited plenary talks at the major international conferences in the field. She has been a member of several international committees, such as the Scientific Council of the CNRS (France), the Physics Advisory Committee of the Fermilab Laboratory (USA), the Council of the European Physical Society, the Scientific Council of the DESY Laboratory (Germany), the Scientific Advisory Committee of NIKHEF(Netherlands) and the Scientific Advisory Board of the UN Secretary-General, Mr Ban Ki-moon. She received honorary doctoral degrees from the University of Uppsala, the École Polytechnique Fédérale de Lausanne, McGill University (Montreal), University of Oslo, University of Edinburgh, University of Roma Tor Vergata, University of Chicago and University of Naples. Dr Gianotti was awarded the honour of “Cavaliere di Gran Croce dell’ordine al merito della Repubblica” by the Italian President. She received the Special Breakthrough Prize in Fundamental Physics (2013), the Enrico Fermi Prize of the Italian Physical Society (2013), the Medal of Honour of the Niels Bohr Institute (Copenhagen, 2013), and the Wilhelm Exner Medal (Vienna, 2017). She was included among the “Top 100 most inspirational women” by The Guardian newspaper (UK, 2011), ranked 5th in Time magazine’s Personality of the Year (USA, 2012), included among the “Top 100 most influential women” by Forbes magazine (USA, 2013 and 2017) and considered among the “Leading Global Thinkers of 2013” by Foreign Policy magazine (USA, 2013). On 1st January 2016 she has become Director-General of CERN.